I’ve been a fan of Cambridge Audio’s solidity-built, and truly classic UK hi-fi kit for a number of years, they also go easy on the pocketbook which is an added bonus. The company has just released the Solo ($179.99 USD) and Duo ($299.99 USD) – dedicated phono stages with the Duo featuring a full 6.3mm (1/4inch) headphone-jack output and both moving magnet and moving coil capabilities. Short signal paths and a compact design are seductive engineering/design cues for those who may have minimal space – a situation more and more big-city urbanites are finding themselves in these days as density rises and apartment footprints shrink – but it’s those short signal pathways that usually best serve the attention to detail that delicate electro-acoustic signals from a cartridge’s stylus need to sound their best. I’m very keen on the cost, especially from a budget-conscious, or young vinyl-lover enthusiast’s perspective. While grabbing a decent turntable online or through a trusted bricks & mortar shop has become more affordable than ever, it is still a major investment for teens or 20-somethings looking to get into high fidelity. Add in an amp, speakers and cabling and things can start to look like an entire pay check pretty fast. But what if you went the Cambridge Duo route? A turntable with a set of RCA interconnects and this little box and you’ve got a compact and fairly affordable vinyl headphone-listening rig. I’ve got the Duo in-house as of now, so I’ll be hooking it directly to my Thales TTT-Slim II fitted with an Easy Tonearm, and EMT JSD VM cartridge. (Not an average analog front-end rig, I know, but it’s what I’m running). Listening will be done through a mix of Sennheiser HD800s (once they are back from being repaired since they had their inner liners torn out before being shipped to me), Sennheiser HD600s, AudioQuest NightOwl Carbons, and Mr Speakers Aeon Flow. Look for a review shortly. The Solo and Duo both use the latest switch-mode power supplies and surface-mount technology to allow a compact overall design with short signal paths on the board inside. This guarantees a faster response, greater precision and importantly, lower background noise levels, free from the hum and noise that can badly corrupt the delicate low-level signals of vinyl. By specifying switch-mode power supplies, Cambridge Audio has been able to use smaller transformers, while maintaining or improving power output levels, which in turn has allowed for a compact and minimalist design. Switch-mode power supplies and software control also allow for improved energy efficiency. Both phono stages automatically switch to standby (with energy consumption of less than half-a-watt) if unused for 20 minutes. 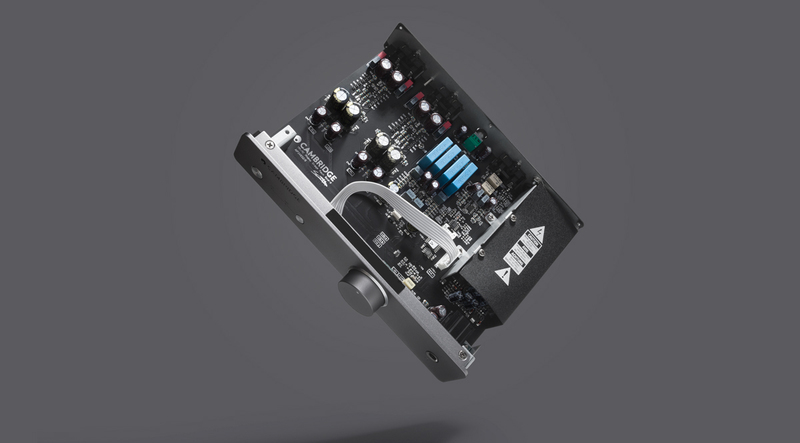 Both phono stages feature a rear-mounted balance control to trim channel-level imbalances in cartridges. Solo has a simple fascia with just an LED indicator, while Duo adds a full-size 6.3mm headphone jack and volume control. Where are unexpensive transformerless MC inputs regularly fail is the signal to noise ratio. For really challenging the MC input stage's noise figures you would need a low output MC system. Something in the range of 100µV output level, about 20dB less than your 1mV output level EMT cartridge, which might work even better on an MM input as it could easily overload an MC input. lift the tonearm from playing an empty section of a high quality vinyl pressing, the noise must significantly drop when the needle leaves disc. I'm curious how the preamp behaves when connected to other devices via the RCA connectors. Switch mode power supply does not sound promising. The chance is there that you get stray noise from line potentials sneaking in. You were joking, 'cuz I was. Is it true that some records sound better on headphones than loudspeakers ? Probably all good vinyl would sound better on headphones. I can talk to Mat Weisfeld at VPI about getting a VPI Player no problem.. Put some naked photos too, we are all suckers for that kind of stuff. Kind of disappointing they don't list the headphone stage specs. They should be willing to tell you about that if it's something worth considering as a headphone solution. When I do the review I'll be pumping them for more technical information. I usually like to talk with someone who was part of the engineering team who developed the product. Was the HD800 you sent to be "repaired" the one that was carefully and deliberately modified for this article: https://www.innerfidelity.com/content/diy-modification-sennheiser-hd-800... ? It seems like it would have been a better idea to source a stock HD800 from somewhere else. The HD800's history of modification and the establishment of a set of standard modifications is significant in headphone development and worth preserving. If they are the modified headphones it seems like a disservice to only include a passing remark about having 'their liners torn out" without any acknowledgement that this was part of a community effort that led to a measurable and audible improvement to the headphones. Yeah, I'm assuming they're the same ones – I checked the "mods" – except there was no foam inside of them at all, just bare plastic, and glue. That's strange, I wonder why they ended up like that and also wonder why they were then included in the shipment to you. Getting them repaired is definitely better than having them sit deconstructed. I'm glad that my assumption was incorrect, though a bit disappointed that you weren't able to hear both a modified version and a stock version. Like many products these days that "require" an upgraded power supply or a digital-digital converter to use the best input, certain headphones with reference modifications are worth considering seriously in those forms.